Business advertising in St. Louis isn’t as simple as it used to be. With more and more competition each year, business owners are looking to print advertising for new ways to increase their visibility and augment their websites, business cards, and posters. They’re looking for advertising with that wow-factor—the power to grab the attention of potential clients. The St. Louis economy is getting stronger each year, and more and more businesses are opening up their doors. This means that effective advertising must stand out from the crowd; it has to work quickly, by making big and bold impressions. For the busy population of St. Louis, printed banners have instant impact and appeal. Where its optimal placement is. Do you plan to use exterior or interior banners? Where is traffic flow heaviest? How big the banner should be. Look at the dimensions of surrounding advertisements in order to size up how big yours should be for maximum impact, especially if using exterior banners. What the end goal is. Are you promoting a new product, advertising a grand opening, or trying to increase revenue? The message you convey and the design you use will be dependent upon your overall advertising goal. Gloss vinyl, which is generally thought to have the highest color vibrancy. Matte vinyl, which cuts down on glare and is best utilized in areas of intense sunlight. Mesh, which easily withstands wind by reducing tension from extreme weather conditions and prolongs the banner’s life. Also consider the time of year you will be using the banner, weather conditions it will be habitually exposed to, and the duration for which it will be hung. Hemming or edging for added durability. The ability to hang the banner from a hook or pole, including the number of metal grommets. Some businesses find that narrow, feather-shaped flags are the right option for their outdoor advertising needs. Because the flags are suspended from a sturdy, curved base that is easy to disassemble, they are an excellent option for sidewalk announcements. Entryway advertising; customers just entering a location will be open to information and advertising. Directing customers to key areas; designating the locations of sales items or customer assistance can direct your customers to places that are likely to result in purchases. Durable polyester for flags on curved stands. Cloth materials use a dye-sublimation process for vivid, long lasting color. 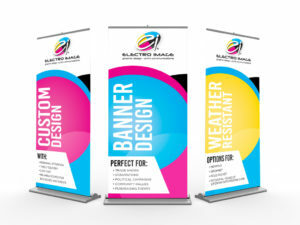 After you’ve determined the general purpose and size of banner that will fit your space, you should consider whether a hanging banner or a retractable banner will be most effective—though there are some who insist that free-standing banners have the most impact. Trade shows are great opportunities to showcase your company to customers and to others your industry. But trade shows can also be an ear-splitting cacophony of noise—aisle after aisle of different businesses clamoring for notice, doing their best to grab the customer’s attention. When your company attends a trade show, you have to grab attention and grab it fast—or those potential customers may only give your booth a brief glance as they walk on by. How do you stand out from the crowd? Sharply printed and vibrantly colored back-wall banners, ceiling banners, flags, and banner stands are an effective way to get noticed. Flexible, lightweight, and adjustable banners are best for strategically configuring your space, and adjusting that arrangement as needed. The print quality, color vibrancy, and placement of your banners are essential to how well you are able to promote your company, its message, and its persona at a trade show. What Makes A Great Banner? In general, the fewer words, the better: people will rarely read what you have to say, no matter how interesting it is, so make your message short. All elements of your design—from color combinations to font type—must be consistent with your company’s style and branding. Look at your brochures, flyers, stationery, and business cards. Is your banner recognizably part of the same set? Overall, your banner design should be bold, graphic, and colorful. Remember that you are competing for attention, regardless of whether you use interior or exterior banners. If you know what you want to say, but you don’t know how that message will look on the banner, consult your printer or graphic designer. Printers in St. Louis can take your idea and make sure that it will translate effectively into a sharp and stylish banner that has real impact on your advertising campaign. You have one chance—often no longer than a few seconds—to grab attention and pull in your customers. Find a St. Louis printer who can ensure that your banners will be printed on quality and durable materials that will appeal to your target audience.